Major new releases of iOS tend to bring with them plenty of complaints of poor performance on older devices, and iOS 8 was no different with regard to how it ran on the iPhone 4s and iPad 2. Neither hardware is getting any younger, and with limited hardware at their disposal both the iPad 2 and iPhone 4s have been found dwindling in the old speed stakes. Curiously, Apple has very recently released a beta of iOS 8.1.1 to developers that has an interesting line in the release notes. Specifically mentioning the iPad 2 and iPhone 4s by name, Apple says that iOS 8.1.1 improves performance on those devices which will come as wonderful news to those struggling along with them. Of course, the real question now is whether that performance increase translates into real world use. 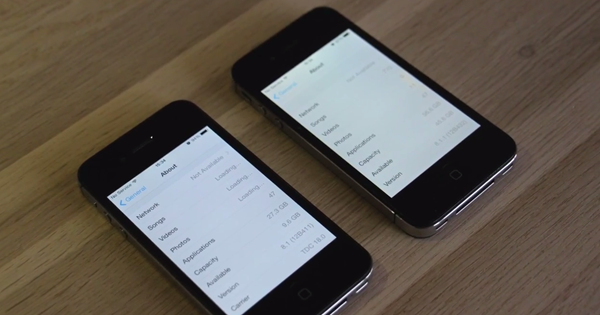 YouTube user kabriolett has published a video that aims to put just that to the test using a pair of iPhone 4s handsets – one running the latest shipping version of iOS, version 8.1, and the other running the new beta release of iOS 8.1.1. The video, which is far from a scientific test, has both devices being put through their paces side-by-side across a wide range of activities ranging from initial startup to having benchmarks run on them. The end results are mixed, with some tasks proving quicker on the new beta software and others performing more speedily when performed on the current shipping release. Whether things will change before iOS 8.1.1 finds its way into the public domain is anyone’s guess at this point, but it’s pretty clear that those using an iPhone 4s or iPad 2 probably shouldn’t expect to see massive speed improvements, if indeed there are any at all. The best course of action to take at this moment is time is to simply upgrade your hardware. Software updates might pump life into older hardware for a short moment of time, but eventually we all know that our aging gadgets will eventually give up on us. In short, it’s time for an upgrade no matter what. After all, who doesn’t like to own newer gadgets, right? THIS POST WAS WRITTEN BY APPLE TO MAKE US UPGRADE. Why I have the feeling that Apple is dead? With android lolipop who really thinks for an apple product, I have an iPhone 5S and I don’t see any point for a new apple product any more. You also missed my point. They patched the jailbreak on 8.1.1, so people are thinking whether they should update to iOS 8.1 now and wait for the pangu consumer jailbreak or stay on iOS 7.1.2 jailbreak. It was implied. People who watch this videos usually know about the news. So the solution is to buy a new iPhone? Pathetic! If I have a phone I expect it to work, I can’t be forced into buying new hardware overtime a software update is released. That is just ridiculous! But then again this whole iOS 8 release has been this way. BTW I got an iPhone 5C that is also working poorly, so should I upgrade that one too? Sorry, but what is really happening is people upgrading to android cause it is just more stable at the time. Except the betas have BG debuggers running which slow everything down. The fact it loaded a few things faster than 8.1 is promising. A beta vs GM benchmark is unfair, not to mention thy stent clean restores. Unfair and insufficient test.